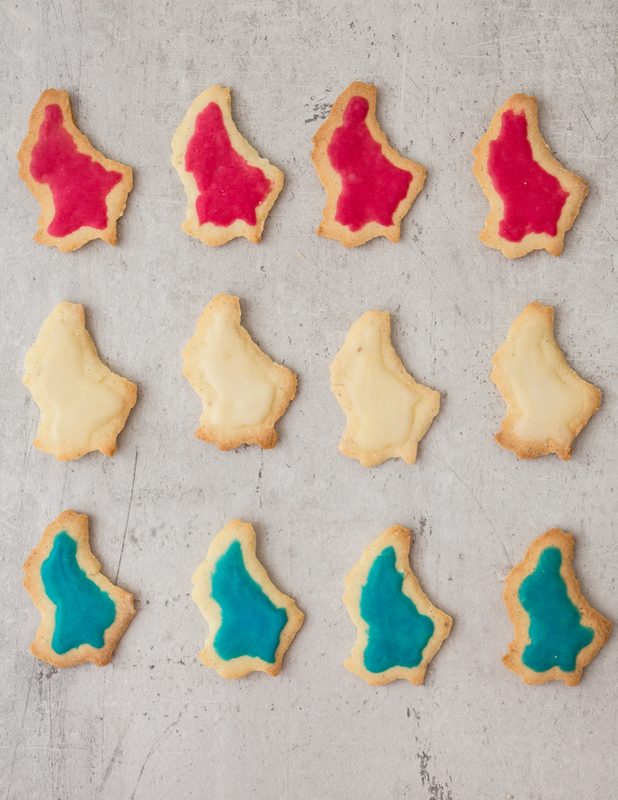 You can’t imagine my excitement when I created these patriotic Luxembourg-shaped cookies! Total joy! And in honour of these cookies I had these fabulous cookie cutters made (in pink and in blue), you can get them here. Of course make these cookies with any kind of cookie cutter, patriotic or not, they will always taste of home due to their honey schnapps-spiked icing. The cookie dough is also an excellent base for any flavoured sugar cookie: around Christmas time you can add cinnamon to the dough, or a sprinkle of grated lime zest to the icing. You can watch how to make this recipe here. This is a recipe from my book “Home Sweet Home – My Luxembourg”. You can buy the cookie cutters here. Cut the butter into cubes and put in a mixing bowl together with the icing and vanilla sugars and mix. Slice the vanilla bean lengthwise, scrape out the seeds, add them to the bowl and mix. Add the egg and mix again, then add the flour and salt and beat into a smooth dough. Flatten the dough into two discs, wrap in cling film and refrigerate for 30 minutes. After 30 minutes, preheat the oven to 170°C fan. Roll out the chilled dough on a surface dusted with flour. Cut out cookies with a cookie cutter and place on a baking tray lined with baking paper. Bake in the preheated oven for 10 minutes or until browned at the edges. Transfer to a wire rack and leave to cool completely. Once the cookies are cool, prepare the icing. Put 40g of icing sugar in a small bowl, add 1 ½ tablespoons of honey schnapps and a few drops of red food colouring and mix into a smooth icing. Decorate one third of the cookies with the red icing. Repeat the same process with the blue food colouring, then mix the remaining icing sugar with the remaining honey schnapps to create the white icing. Leave the iced cookies to set for at least 1 hour. The cookies will keep in a tin for at least 1 week. TIP: You can replace the honey schnapps with lemon juice or milk for an alcohol-free treat.